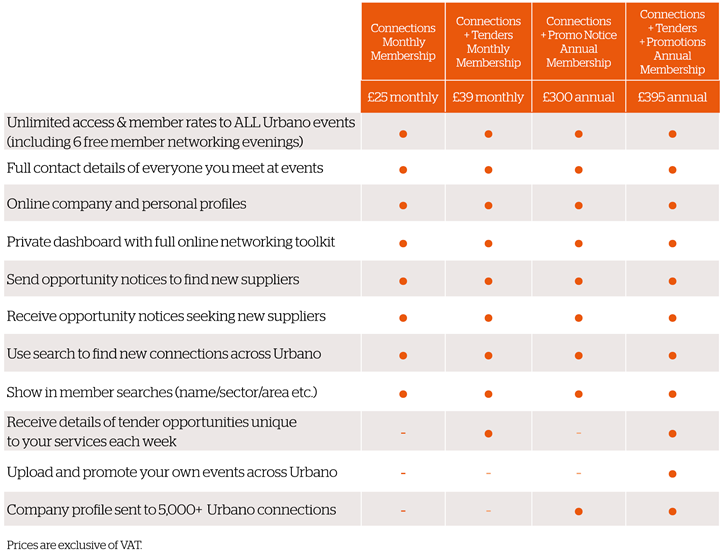 Urbano is a membership organisation and only on joining does the full power of Urbano only become apparent, unlocking the full networking toolkit we offer, connecting you to over 5,000 + Urbano Members & Associates. We allow companies to send representatives to a maximum of TWO events as non-members and at appropriate non-member rates. This is to allow you to gauge the quality of our events, the range, diversity and friendliness of our membership and the potential value of becoming part of Urbano to your business. All membership prices shown are excluding VAT. All monthly direct debit memberships are for a minimum initial 12 month term. Membership and terms above are for COMPANIES. Organisations such as universities and others which work on funded projects and wish Urbano to help on deliverables, please email Caroline to ask about Partnerships. Annual Members can list up one event per month on our Member Events Calendar and we will add these links to our monthly events mailers sent to 75,000 subscribers plus our weekly events notice sent to 5,000 Members and Associates profiled on our website. We reserve the right to refuse any membership and consider each application on its merits.